"He never wept so much for any sorrow in all his life, and for a month he could not be quiet for sorrow: and he bought a book of prayers and prayed for the soul of the Maid." Guillaume Manchon, recorder of the Trial, notary of the ecclesiastical court of Rouen, was a canon of Rouen and Evreux, curé of Saint Martin de Vitefleur, and later of Saint Nicolas of Rouen, and almoner of the Confrèrie de la Calende of the Doyenne de la Chrétienté of Rouen. Court promoter, from 1437 to 1443, he prosecuted the matter in which Jean Massieu was accused of being bad-mannered; in this capacity he visited the abbeys and priories of the diocese in 1440, and is cited as promoter; in 1453 he was in charge of taxes and disbursements. He died on December 9, 1456. We find that, on September 21, 1440, Guillaume de Croisemare, Bailly of La Madeleine at Rouen, attested to certain of his endowments: Guillaume Manchon is cited as notary of the court of Rouen, cure of Vitefleur since October 31, 1436, canon of Evreux, promoter of the ecclesiastical court of Louis de Luxembourg, Archbishop of Rouen, premier chaplain by election and appointment of the brothers of the company of notaries, (September 13, 1440). Among the witnesses cited we encounter Pierre Cochon, cure of Vitefleur, notary of the spiritual court of Rouen. We see the signatures of Manchon and Nicolas Taquel on the original act of foundation, 1436. A commission, given in the month of October, 1445, by the commissioners on the matter of incomes pertaining to churchmen, indicates that he was charged to receive the fruits of the revenues "of curacies situate within the diocese of Rouen, of which the curés are absent and living outside of the jurisdiction of the king." 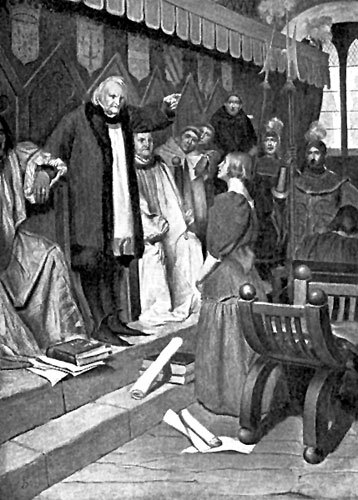 Guillaume Manchon, who delivered into the hands of the judges of the Rehabilitation the minutes of the Trial, testified before them in 1450, 1452 and 1456. He testified with prudence, and accused the Bishop and the English.